At LinuxTag in Berlin, Germany, the more members that turn up for the annual event, the more difficult it becomes to use IMAP to retrieve their email. This time, the venue’s network connection was more than generously dimensioned, and the system load had been tested up front; with an uptime of more than 500 days, the server had a load of less than 0.4. But people still couldn’t access their mail. New this year were NAT-based addresses assigned to organizer’s notebooks. In previous years, when IP address scarcity had probably not been an issue, the LinuxTag network team’s DHCP server assigned public addresses instead. From the IMAP server’s point of view, users hiding behind a NAT gateway appear to all have the same IP address. Some Courier implementations of imapd restrict the number of connections from a single IP as a security measure. It looks like nobody envisaged a crush of clients on a private network like this. Although the organizers’ technical team quickly identified the problem, the challenge was to find the right place to change the configuration as quickly as possible. The developers of the Courier IMAP server spread this functionality across half a dozen individual programs: Launched by courierlogger, couriertcpd first accepts all connections for SSL-encrypted IMAP requests on TCP port 993. It uses a ruleset to decide whether or not to accept connections from a host. It then hands off to couriertls, another wrapper that handles the task of opening the SSL connection. couriertls then calls imapd proper via another intermediate step (imaplogin), and the daemon hands over the message to the client. In many cases, the system administrator needs to find out exactly how the programs call each other. This is all the more the case when you need to shut down the whole service and its programs, change a parameter in the configuration somewhere, and then relaunch everything – which is what you need to do to adjust the clients per IP threshold, for example. A runlevel-specific script in /etc/init.d controls these processes. In the course of ongoing modularization and configurability, a conglomerate of scripts and parameter definitions with various conventions has developed from what was a single large file, /etc/rc.local, in the good old days of BSD. (Many administrators are still skeptical about the designated successors such as Upstart, Systemd, and the like). would continue to run the correct calls in the second and fourth lines, but would output a message about the missing xy in line 3 before Bash went on to execute id. However, if you used the set -e option after the Shebang line, the script would terminate after xy. The two flags remain active for all subsequent calls in this shell, which means you need to reset them later on by issuing set +x or set +e, or remove the line from the source code. Instead of manually parsing the file, you can execute it as a separate script, and to do so, you seem to only need to call the script name, as in ./configuration.sh. The problem is that this creates a new shell that manages its own variables. The calling script remains blissfully unaware of this (Figure 1). Figure 1: The top.sh script calls the bottom.sh script, which could set configuration parameters. The administrator needs to distinguish between a simple call, exporting environmental variables, and sourcing scripts. Using uppercase for variable names doesn’t change this, contrary to a widespread misconception, as you can see from APPLE in Listings 1 and 2. In fact, using uppercase is merely a convention for identifying environment variables, and you need the export keyword to make them stick. 03 # Remove to see more detail! This trick will not help you read configuration settings, as the output from the test scripts just goes to prove. Although you can send data to the subprogram, you can’t get them back again. You need the source keyword for this – or alternatively, a dot character (.) (Listing 1: line 29). 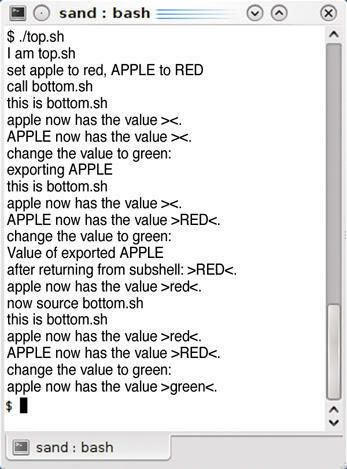 In this case, Bash treats the child script as if it had copied its source code into the calling script. The paths of many a startup or configuration script are winding, but not unfathomable. The -x or -e shell options can help administrators perform a systematic search. You always need to take a close look when you integrate configuration files; after all, a single dot (. ), as a synonym for source, can mean a huge difference in the execution of a subshell . Armed with these tools, the LinuxTag admins located the MAXPERIP parameter and increased it, so the organizers could open the doors to LinuxTag for business as usual.